With the 2018 Jaguar E-PACE compact SUV, you get a perfect blend of capability, luxury, innovation, and comfort. This is obvious in the stylish, beautifully crafted, and refined interior. Every aspect of this luxury SUV is designed with driver and passengers in mind. The driver-focused cockpit keeps everything important conveniently within view and easy reach of the driver. The functional center console has removable cup holders to allow you to store other essentials, such as tablets, inside. 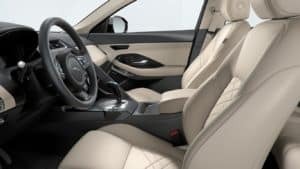 The impressive cargo space includes loadspace width of up to 4.2 ft. Plus, the cargo capacity is up to an impressive 52.7 cubic ft.
Let the Jaguar experts at Jaguar Colorado Springs introduce you to the luxurious practicality you will appreciate with your 2018 Jaguar E-PACE. We have several of these beauties available for you to choose from. Stop by today to test out the comfortable interior and try some of the innovative features of this compact SUV. We are sure you will agree that this type of luxury will make your drives, from daily commute to long road trip, amazing!